The story below has a happy ending. It is important to know that before you start reading this blog. Steve Fisher, our Environmental Education Coordinator, wears a whole lot of hats here at REGI. We tease him those odd tasks are "opportunities for personal growth." He could enjoy a rather sedate life as an educator, but we want more than that for Steve. One day last summer Steve was enjoying a day off. 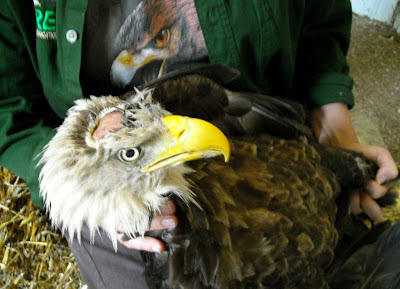 I called him to "check on a situation" with a Bald Eagle near Wausau. 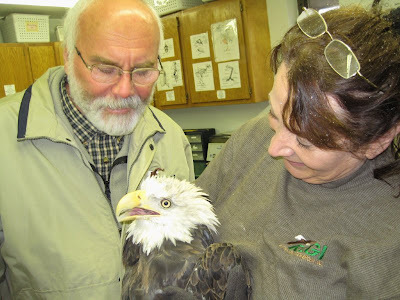 Steve and his wife Evie ended up rescuing a Bald Eagle that was flailing desperately in Lake Dubay. The Fishers' car pulled up to the REGI clinic. I was waiting for them. From the look on Steve's face, I expected this was a difficult case. 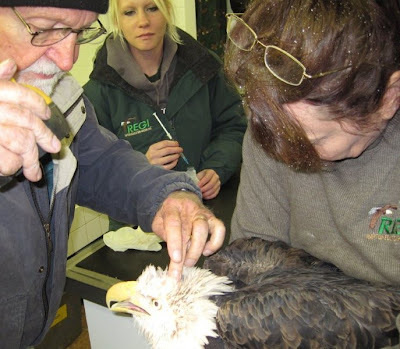 Steve's tension was obvious as he relayed information even before the box with the Bald Eagle was in the clinic. There were words like "can't figure out," "bad injury," "not sure," "something wrong with the head"...anyhow you get the picture. He did not appear to be in pain. Maybe a headache, but nothing overt. Once he was dry, warmed and comfortable, he ate well. He seemed normal, except for the glaring lack of skin and feathers on his head. The great news is that Baldy now has a full head of "skin" covering his scalp. He also has most of the feathers back as well. We look for his release to the wild soon. 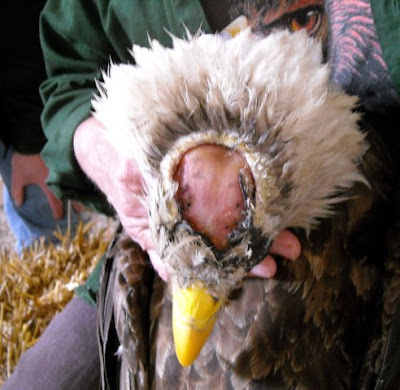 Many thanks to Steve and Evie Fisher and my great REGI team for making this horrific case a success. 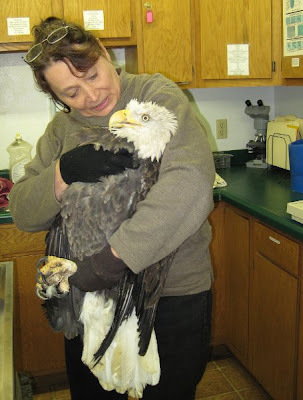 REGI will be releasing several Bald Eagles into a wintering flock in mid-January along the Wisconsin River near Sauk City, WI. Baldy may well be among them. We will give more information as the time gets closer. oh. Thank you for helping this beautiful creature. I'm so glad he made it!